Mucous membrane of the upper respiratory tract of humans. Found in the nasopharynx of approx. 75% of healthy peoples. 3-0.5 um X 0.5-1 um with rounded ends. Prolonged counterstaining for 5-15 minutes with very dilute carbol fuschin often gives satisfactory results. Capsules are present and important in pathogenicity. It is the first free living organisms to have its entire genome sequenced; 1,830,140 bp of DNA and 1740 Genes. On Blood Agar: translucent, low, convex or flat pin point colonies, Satellitism. In liquid medium like Levinthal’s Broth or Filde’s Broth: Uniform Turbidity. 5 to 0.8 mm after incubation at 37˚C for 24 hours, can enlarge upto 1-1.5 mm by 48 hrs. Capsulated strains form larger, more opaque, smooth, mucoid colonies, 3-4 mm in diameter. Fastidious and Facultative anaerobes and aerobic, grow also in 5% CO2. Requires 2 accessory growth factors, a head stable growth promoting substances present in Red Blood Cells (X-Factor) and a heat labile vitamin like substances (V-Factor). Hemin, plays a role as an enzyme in respiration. Provide protophyrin IX, iron can be obtained from another source. Present in the tissue of plants and animals. Heating blood agar to about 75˚C, until it acquires a chocolate agar, releases V-Factor from Red cells and also inactivates NADase activity. aureus release V-Factor during growth, which defuses into the surrounding medium, enhancing the growth of H. influenzae. V-Factor is involved in oxidation-reduction process in the growing bacterial cell. influenzae requires pantothenic acid, thiamine and uracil. 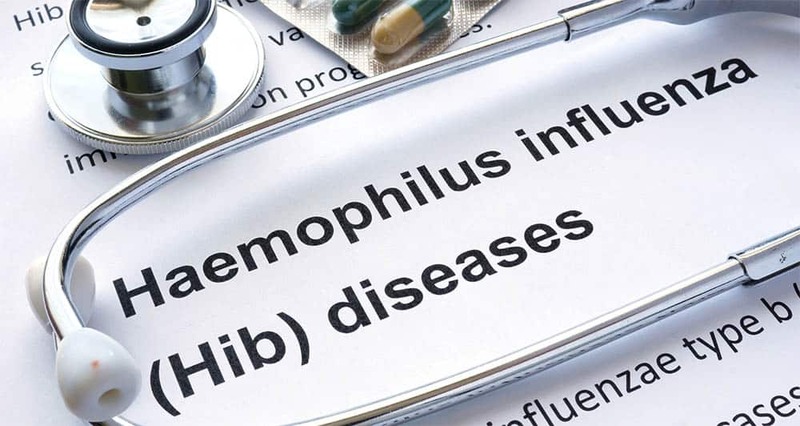 Haemophilus influenza b (Hib) is the major cause of childhood infectious disease. It causes meningitis, primary bacteremia, pneumonia, epiglottitis and arthritis. Encapsulated organisms –> penetrate the epithelium of the nasopharynx –> invade the blood capillaries –> infection. Capsule resists phagocytosis and complement mediated lysis. Transmitted by direct contact, inhalation of the respiratory tract droplets. Specimen: CSF, Sterile site aspirates, fluids, urine, sputum, Respiratory tract specimens. – On Blood Agar: translucent, low, convex or flat pin point colonies, Satellitism. – On Chocolate Agar: Grayish, Transparent, smooth, low, convex or flat with a slightly splayed out, entire edge, mucoid, pale. – Test in case of meningitis. First line of treatment: 3rd Generation Cephalosporin with good CSF penetration. Ceftriaxone and Cefotaxime is used in case of Meningitis and Septicemia. In poor countries, Chloramphenicol alone or in combination with Ampicillin. For non-invasive infections: otitis media, sinusitis, bronchitis: Amoxicillin is used orally. Could u plz explain about the serolgical tests done to diagnose hemophilus influenza ?? Beautiful write up. Satillitism simply means locating the source of nutrient. Since S.aureus produces V factor n H. Influenza requires same for growth;as s.aureus releases it on growing,H.influenza starts growing around s.aureus as it locates its nutrient(V factor). This occurs wen H.influenza is spread on blood agar n a streak of s.aureus made across culture plate in a straight line as shown d picture above. Sagar, hope i got it.